April 2017 sees the latest in our series of Facilities Management Legal Update events, covering everything that FM professionals need to know about the very latest changes in health and safety, environmental management and HR practice. David Sharp reflects on how the event has changed in the 18 years since it was launched. 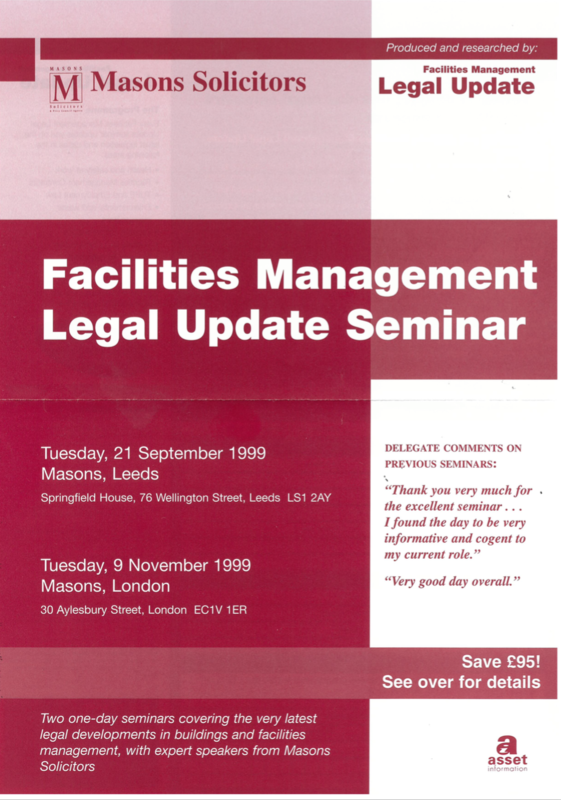 I remember the first ever Facilities Management Legal Update event, which took place in Leeds in association with Masons Solicitors (now Pinsent Masons) on 21 September 1999. A second event followed in London six weeks later, and ‘FMLU’ (as it became affectionately known by us) has been running ever since. Those first events were a half day in duration, covering many of the same subjects we are addressing at our next event in April 2017. I still have the promotional leaflet for the event, which states: “This seminar has been specifically designed for managers who cannot be expected to be an expert in all these subjects, but nevertheless need to know about legal developments in order to manage risks in the workplace.” Still as valid today as it was 18 years ago! Sessions on health and safety, environmental law, and TUPE would not be out of place today. The Fire Precautions (Workplace) Regulations 1997 and 1999 had not long been in force, bringing with them a requirement for owners and occupiers to carry out a fire risk assessment. Disabled access was a hot topic, with Part III of the Disability Discrimination Act 1997 and changes under Part M of the Building Regulations coming into force in October 1999. The Government had recently introduced a draft Approved Code of Practice on smoking the workplace. Remember that? (Remember ACoPs!?) The conference session promised to “inform and update participants on drafting and operating safe and fair policies on smoking in the workplace”! Workplace parking was becoming a topic of concern to facilities managers, with the conference preparing delegates for “workplace parking charges expected in the next parliament”. In the years since then, FMLU has changed with the times, growing to become a major annual two-day conference and dinner attracting over 140 delegates, shrinking back to its roots during the early years of austerity to become a one-day seminar with just six attendees. I many ways, FMLU has become the backbone of the business – our company name has changed twice since that first seminar in Leeds! By our reckoning well over a thousand people have attended FMLU over the years, and despite tinkering with its name and format, it has always remained true to those ideals set out in the very first event in September 1999. Our next Facilities Management Legal Update is a one-day event taking place at the International Workplace Executive Centre in London, on 20 April 2017. 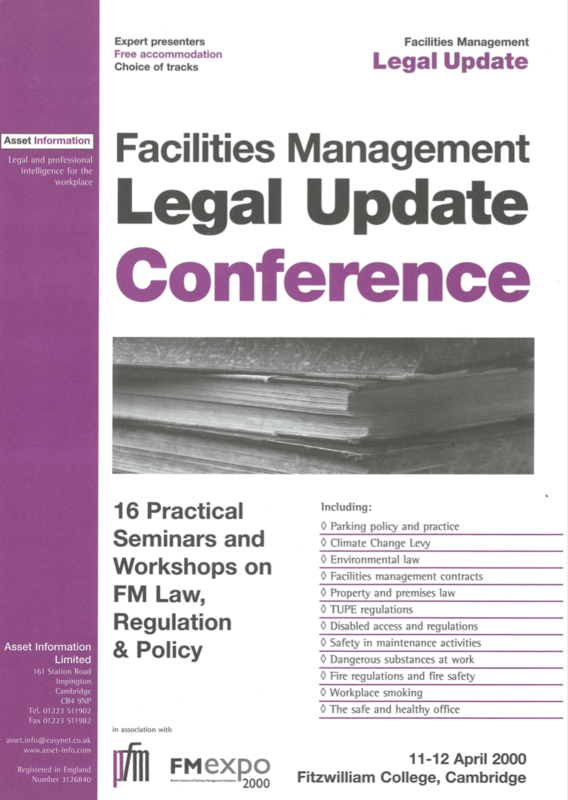 Find out more about the next Facilities Management Legal Update, where you can also download a programme and save 10% when you book online.